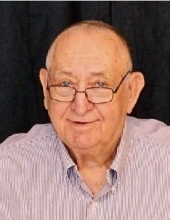 Mr. Homer Kamer, age 79, of Garrison, Kentucky, passed away Thursday morning, November 1, 2018, at his residence. He was born November 8, 1938, in Lewis County, Kentucky, a son of the late Lewis and Cora Opal Bentley Kamer. Homer was a member of the Bivens Chapel Church and worked until his retirement for Ashland Oil. He loved going to church, traveling, tractors, farming, Tennessee Walking horses, going to horse shows and spending time with his family, especially with his grandchildren. In addition to his parents, he was preceded in death by one son, Anthony Lane “Tony” Kamer. Homer is survived by his wife of 61 years, Mary Pollitt Kamer, the love of his life; one son and daughter-in-law, Bill and Tammy Kamer of Garrison, Kentucky; three grandchildren, Toni and Joseph Toller, Kalee Kamer and Cody and Lauren Kamer; three great grandchildren, Dru Prater, Aaron Prater and Keenan Kamer; four sisters and three brothers-in-law, Linda and Leymone McGlone, Hazel and Chester Smyke, Peggy and Jamie Madden, and Lois Kamer, all of Garrison, Kentucky. He also leaves many other family members and friends who will sadly miss him. Funeral services will be held at 11 a.m. Sunday, November 4, 2018, at Bivens Chapel Church in Garrison, Kentucky, with Brother Roger Clark and Brother Ronnie Conley officiating. Burial will follow in the Soldier Cemetery in Lewis County, Kentucky. Friends may visit from 6 p.m. to 8 p.m. Saturday, November 3, 2018, at and after 9 a.m. on Sunday at Bivens Chapel Church in Garrison, Kentucky. Steven Smyke, Joe Toller, Kenny Ruckel, Gary Ervin, Dru Prater, David Pollitt, Chris McGlone, and Jamie Smyke will serve as pallbearers. Globe Family Funeral Chapel in Garrison, Kentucky, is caring for all arrangements for Mr. Homer Kamer. "Email Address" would like to share the life celebration of Homer Kamer. Click on the "link" to go to share a favorite memory or leave a condolence message for the family.